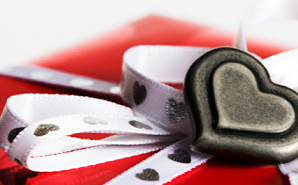 50+ Valentine’s Day gift ideas for nurses! Gulp! That heart-pounding and sweat-inducing holiday is almost upon us…Valentine’s Day. Whether you have a sweetie or are flying solo this year, there’s always something about the holiday that causes some unrest. So we’re here to help take something off your (already full!) plate this V-Day–the dreaded gift brainstorm. Is your significant other a nurse? These gifts will be right up their alley. If you want to shower some affection on your coworkers, we’ve got affordable options they’ll love. Just looking for a little something for yourself? Hey, we won’t tell! Be sure to let us know in the comments below if we missed an amazing gift idea! 1. Male nurse approved gift ideas! We nurses (at least most of us) love to show off and strut our stuff. We love all the coffee mugs, pens, pins, trinkets, sweaters, sweatshirts, etc. that have ANYTHING nursing on them. Anything that boasts what we do is OK in our book. And who could go wrong with a coffee mug that says something about nursing for the one profession that KNOWS coffee? A spa gift certificate–we love massages with no strings attached. A really great pair of shoes that you know we have been eyeing for awhile. Flowers–we do enjoy these, just no baby’s breath. A sweater from our favorite store with the gift receipt (just in case). Something sentimental, like a nice picture frame with a photo from somewhere special. 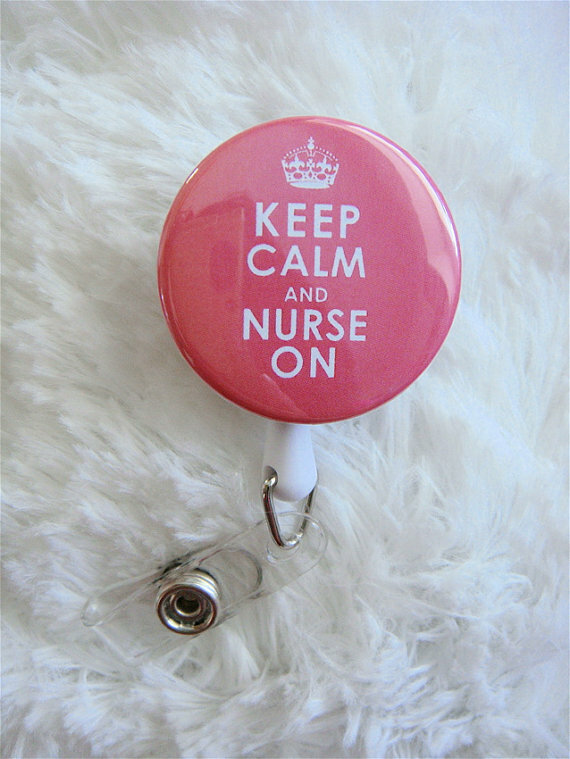 Help keep your favorite nurse’s badge in place and in style with this adorable twist on the ever-popular “keep calm and carry on” slogan and poster. When you’re navigating the sometimes rough waters of your nursing job, you could use a little guidance, a little pick-me-up, a little hand-holding…we’ve all been there. Any book on this list would make a great gift for any nurse on your team — or for your entire team (the quirky Don’t Try This At Home is only $5, for example). By their very profession, nurses give to others every day. On holidays, there are ways to continue that spirit of giving–you can ask for gifts where the proceeds will go to worthy causes or give presents that provide needed resources to charities. Check out these 10 charity gifts any nurse would be proud to receive. 1. Proceeds from The Hunger Site go to Mercy Corps, Feeding America (formerly America’s Second Harvest) and Millennium Promise. Check out the children’s hand-knit bumblebee hat and mittens starting at $10.95 or a hummingbird feeder that attaches to your window for $12.95. 2. One of the world’s largest fair trade organizations, Ten Thousand Villages “strives to improve the livelihood of tens of thousands of disadvantaged artisans in 38 countries.” Available gifts include disk and bead earrings from India for $14 and a silk wallet from Cambodia for $38. If your family or roommates need a gentle reminder of your beloved down time, you might want to hint that you’d love this nifty sign from handmade shop More Than Letters to let them know when you’re catching some zzzz’s. What do you get for someone who’s constantly taking care of others? Most nurses are just plain tired. Their feet hurt and they are exhausted from long hours and long shifts. Wouldn’t it be nice if, for once, someone took care of them?! How about a spa or massage? Let’s not forget about our male nurses out there. The equivalent to a spa day for the men? A ticket to their favorite sporting event. Trust me. 8. Beautiful and fun Etsy picks for nurses! Between the bedpans and the bureaucracy, life as a nurse can get ugly at times. On Those Days, every nurse needs a little extra beauty or humor in their life—something to look at that will make them smile. 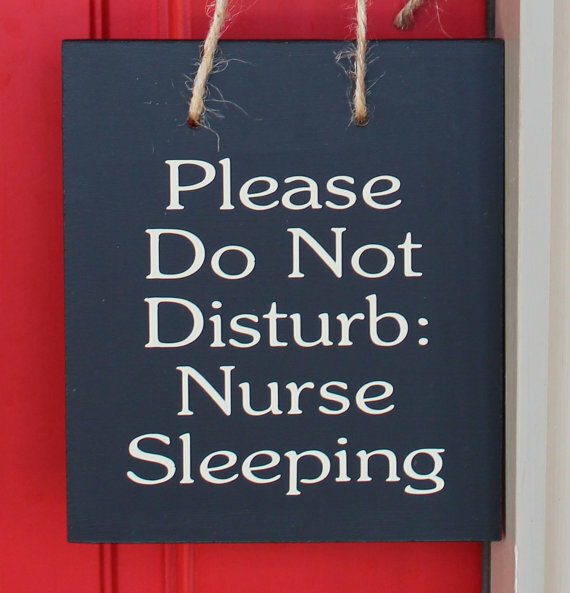 These 10 Etsy selections for nurses will do the trick! It’s a stethoscope cozy! 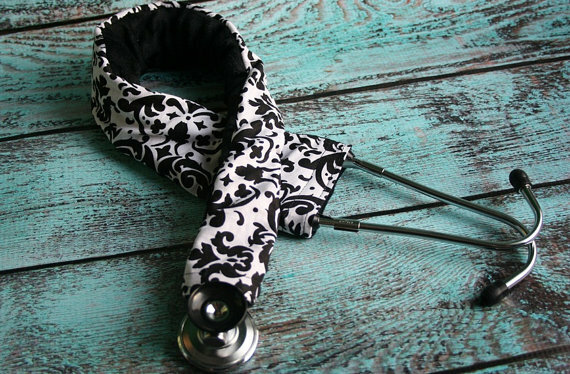 Nursing student PaisleyMaizie makes stethoscope covers from fashionable fabric in a wide variety of colors and patterns. Each one is padded and then lined with ultra-soft Minky microfiber.